Monterey Blvd in Sunnyside features a good many midcentury to late-twentieth-century apartment buildings, giving the neighborhood’s main street a characteristic look. This type of construction required some minor code changes for the district, which had previously been zoned for single-family and duplex buildings. The new larger structures filled up the numerous lots along the boulevard that had remained unbuilt since the founding of the neighborhood in 1891, which was the result in part of the difficult topography; the land on either side of the street is quite steep and rocky in places. Here are some 1940s photos. 1941. Monterey Blvd at the Detroit Steps. Billboard stand where 403 Monterey is now. OpenSFHistory.org. Starting in the 1950s, developers consolidated lots to build large complexes, or constructed multi-unit structures on a single lot. The building could be said to have gone in three waves. Chart showing construction of apartment and condo units on Monterey Blvd, 1958-1997. Data from SF Planning Dept. George R Reilly (1903–1985) was a powerful player in midcentury San Francisco politics who was born and grew up in Sunnyside, a member of one of the first families there. He was on the State Board of Equalization (BOE) for 44 years, the agency that regulated taxes and liquor licenses. Image of George R Reilly from obituary in BoE Annual Report, June 1985. SF Public Library. Under his chairmanship, the BOE targeted bars where gay people gathered, in order to revoke their liquor licenses. It was in this capacity that Reilly’s name remains on an important 1951 California Supreme Court case, involving the famous Black Cat bar in North Beach. The Black Cat (n.d.). San Francisco History Center. San Francisco Public Library. 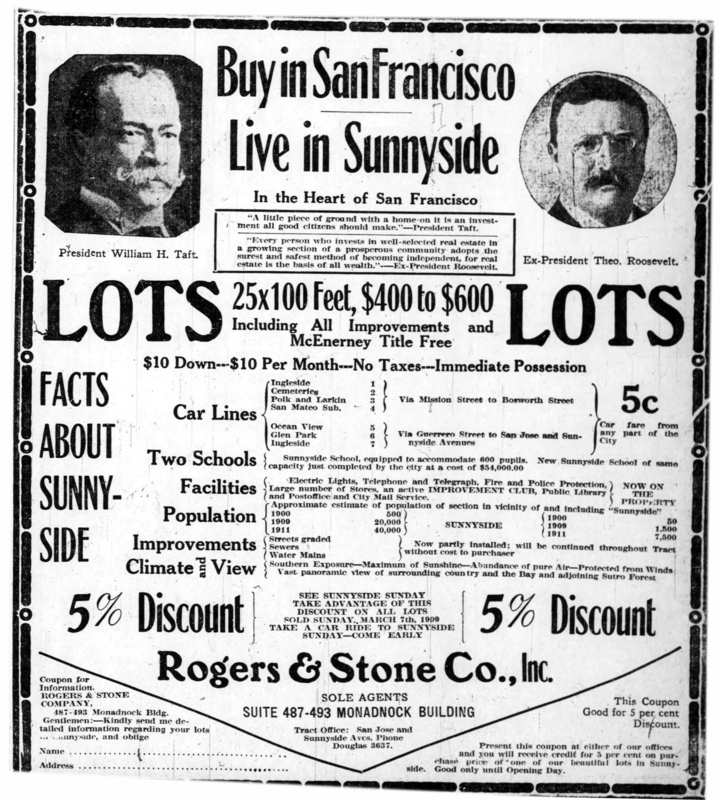 From the Oakland Tribune, 6 March 1909. View larger. The account below by Phyllis Jensen Marklin of being a child growing up in a little house on Congo Street, on the Sunnyside/Glen Park border, includes some fabulous details–the sort of domestic history that is all too often lost with the passage of time. She wrote it when she was in her sixties. Her daughter has graciously given me permission to reproduce it here, along with a photo that includes the family in front of their house at 511 Congo Street. Her parents Axel and Olga Jensen came originally from Arhus, Denmark, but lived in Canada for years before coming to San Francisco. Although not all the children stayed in the neighborhood, Phyllis’s brother Gordon made his home as an adult just a few blocks down Congo. I’ll tell that story in a future post. The Jensens in front of their house at 511 Congo Street, late 1920s. Photo courtesy Judith Simpson. This is the story of two brothers, both newly married, who came to Sunnyside to find houses in the 1920s. One stayed for a lifetime. Both belonged to a remarkable family based up north. The houses they settled in were 400 and 412 Joost Avenue, San Francisco. One of the earliest houses built in Sunnyside, San Francisco, and certainly the first on its block, has some interesting stories that go with its long history. The man who built it, John Albert Johnson, was a prime moving force in getting a school established for the neighborhood in its early days—when the City was prone to neglecting public services there. But he also conspired to have his wife illegally incarcerated in the County Jail, something that made the newspapers on account of its flagrant violation of the law, that a person cannot be imprisoned without a trial. The houses at 400 Hearst (L) and 503 Edna. Photo: Amy O’Hair 2015. For many decades there was a small grocery store at the corner of Hearst Avenue and Congo Street called Frenchie’s. The family who ran the store from 1909 through the 1930s wasn’t French, and the store was never listed that way in the SF Directories, but such is the way of neighborhood shops–you are known by what your local patrons want to call you. 201 Hearst Ave, San Francisco. Photo: Amy O’Hair.